How to Capture Ad-Hoc Ideas with Brainstorm Diagram? Current: How to Capture Ad-Hoc Ideas with Brainstorm Diagram? Great ideas are always the key to success. However, simply having ideas in your mind is worthless, transforming your ideas into reality is more vital. In Visual Paradigm, we have a brainstorm tool that can help to capture your ideas, categorize them and then transform them into a business process design. In this tutorial, you will learn how it works by walking through an example on setting up the process about how to attract customers in a car dealership business. Create a new project by selecting Project > New from the application toolbar. In the New Project window, enter Tutorial as project name and click Create Blank Project. 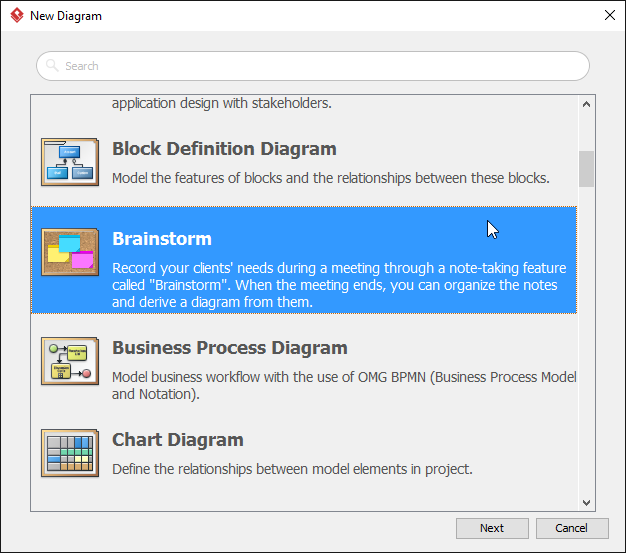 Create a brainstorm diagram by selecting Diagram > New from the application toolbar. 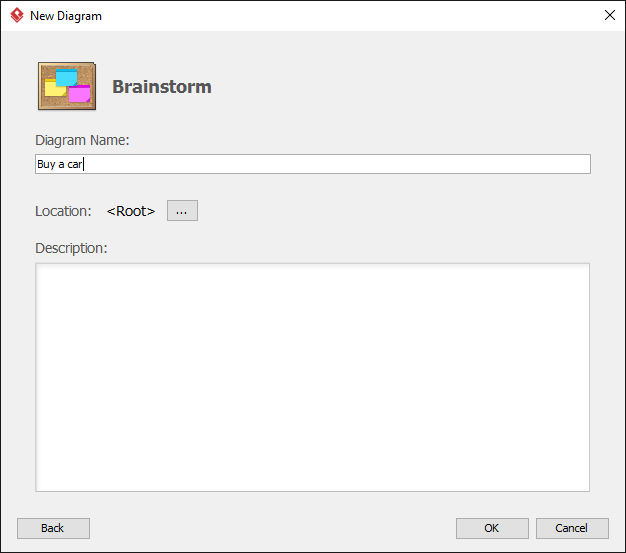 In the New Diagram window, select Brainstorm and click Next. Enter Buy a car as diagram name and then click OK to create the diagram. 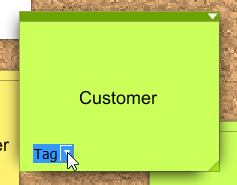 Now select a sticky note from the diagram toolbar and put onto the corkboard. Write down your ideas, i.e. Customer. Note that you don't need a write a paragraph to record your ideas, using short phrases or even simple words are sufficient to remind yourself what it is. Repeat the steps to create the following sticky notes. * You may use sticky notes of different colors to categorize your ideas on the first level. Select a sticky note, let's say customer. Click on Tag at the bottom left corner of the note. Since Customer is a participant in the process of buying a car, therefore we choose participant here. Repeat the steps for the rest of the sticky notes. 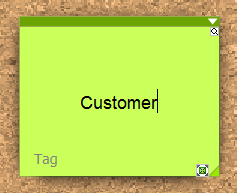 Select a sticky note, let's use customer again. 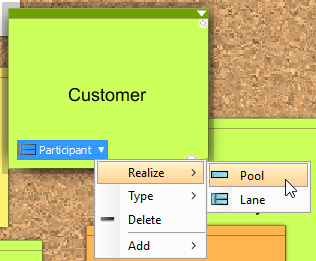 Click on the tag, and select Realize > Pool. The Transit Model Element window will show up. You can do necessary touch up here before you continue. For example, to give a meaningful name to the element to be created. 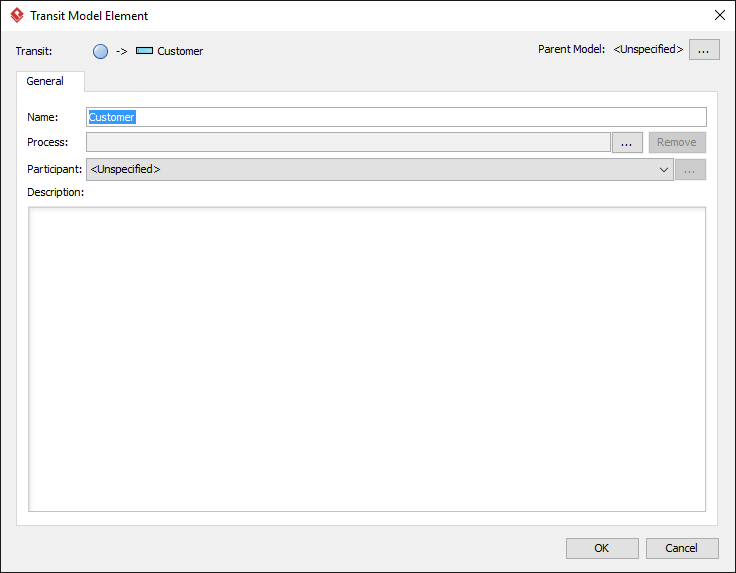 Click OK in the Transit Model Element window. 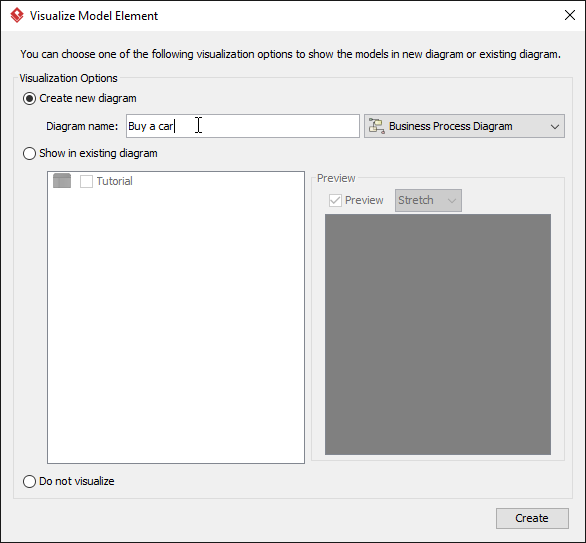 Select Create new diagram in the Visualize Model Element window and name the diagram as Buy a car. 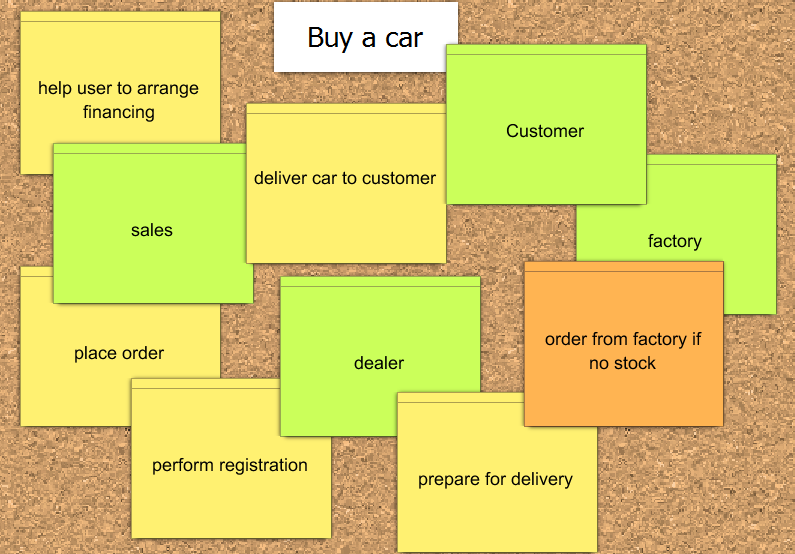 The note customer is now being transformed as a pool in our Buy a car process diagram. Repeat the steps for Dealer and Factory. 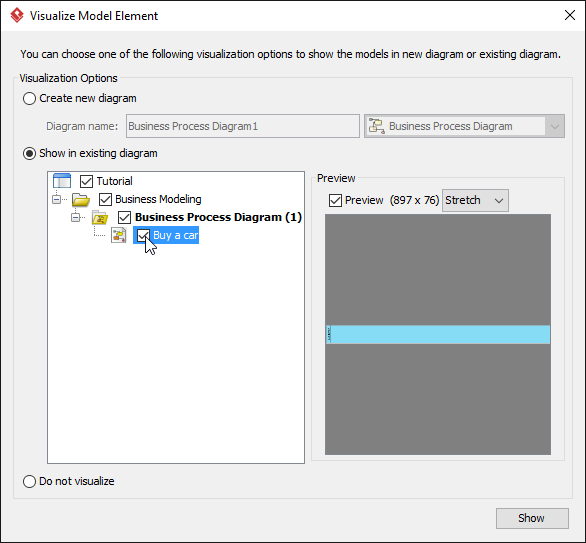 This time, selecs Show in existing diagram and then select Buy a car in the Visualize Model Element window. 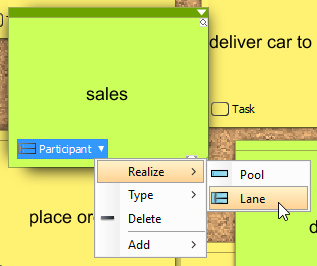 For the note sales, select Realize > Lane from the popup menu of the tag. 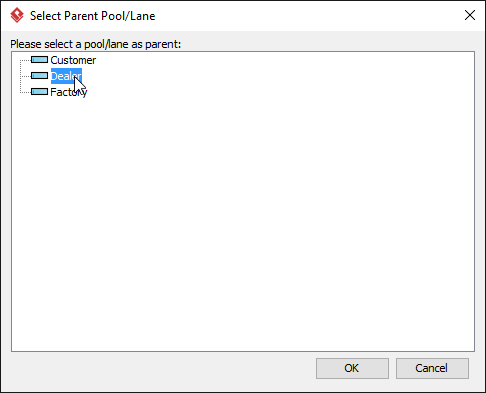 In the Select Parent Pool/Lane window, select Dealer as its parent pool. Click OK to continue. Since we focus on the process about how to attract customers in a car dealership business, the internal operations of Customer and Factory are not our current concerns. To simplify the diagram, let's change them to black box pools by right click on them and then select Black Box. Follow the steps we did previously to realize it into a Buy a car process diagram. Once we have realized all the participants, we can then move on to realize tasks and gateway. Repeat the steps above to realize the remaining sticky notes. We can layout the diagram right after we have realized all of them. Finally you got your process design realized from your ideas. And it will be the kick start of your success. Here is the video version of this tutorial.